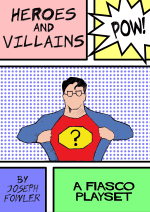 Heroes and Villains is a Fiasco Playset I wrote for fans of comic book and film super-hero stories. Available to download now! Cartoony or gritty stories - you decide! If you enjoyed this playset, I'd love to hear from you. Drop me a note: fiasco@jifish.co.uk or send me a tweet @JiFish. This playset is free to download and share. But if you are feeling generous, I accept most major cryptocurrencies. This playset is an accessory for the Fiasco role-playing game by Bully Pulpit Games. Fiasco is copyright 2009 by Jason Morningstar. All rights reserved. This work is licensed under a Creative Commons Attribution-NonCommercial-ShareAlike 4.0 International License. See also the Fiasco Playset License.